The first backer board with a built-in moisture barrier. 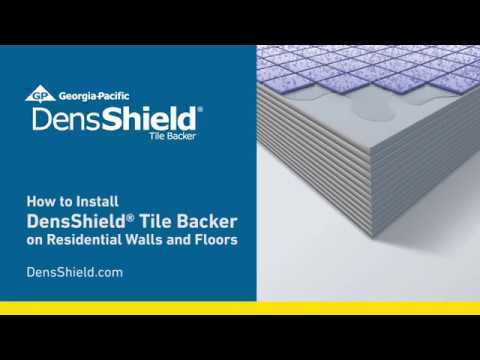 Engineered to prevent damage to the sub-floor or wall cavity if moisture seeps through grouted tile, DensShield® Tile Backer is the first backer board with a built-in moisture barrier. It’s the ideal ceramic tile underlayment for new construction, bathroom remodeling, pool areas, and many other high humidity or wet areas1. Easier to handle than cement board, DensShield Tile Backer cuts and installs like drywall without special tools or fasteners. It can also be painted or used in non-wet areas. DensShield Tile Backer conforms to requirements of 2009 IBC/IRC Code for tile backer in wet areas. It’s available in convenient sizes, including 5/8″ Type X board (per ASTM C1178) for use in appropriate fire-rated assemblies. Dens® Solutions are industry trusted, high-performing fiberglass mat gypsum panels suitable for your wall, roof, ceiling and floor projects. Dens Solutions carry the mark of our valued heritage in Gold, as a visible standard-bearer of our position as the first manufacturer to create a fiberglass mat board and as a relentless innovator of strength and moisture resistant products for over 30 years. Dens Solutions answer building challenges with ingenuity. 1DensShield® Tile Backer has scored a 10 – the highest level of performance for mold resistance under the ASTM D3273 test method. The score of 10 in the ASTM D3273 test indicates no mold growth in a 4-week controlled laboratory test. The mold resistance of any building product when used in actual job site conditions may not produce the same results as were achieved in the controlled, laboratory setting. No material can be considered mold proof. When properly used with good design, handling and construction practices, DensShield Tile Backer provides increased mold resistance compared to standard paper-faced wallboard products. The mold resistance of DensShield Tile Backer has been validated by UL Environmental. Learn more about UL Environmental claims validation at ul.com/ecv.